Toronto's Austra created quite the stir with their debut album Feel It Break, eventually landing them a Polaris Prize nomination. The band have returned with their follow-up, the more accessible Olympia. Despite my healthy dose of Latvian pride, I didn't connect with Feel It Break the way most people did. Katie Stelmanis' voice is undeniably gorgeous, but the songs themselves were too amorphous for me to find gripping. That's changed a little bit on Olympia, with the songs being slightly more grounded with a more traditional structure. The flighty electronic elements have been pared down. The opening track "What We Done? ", for instance, begins as a stripped down number and slowly grows with the electronics deftly layered in. For the most part, when the band has pulled back on the electronics (which I should say are still a major component), they've been replaced in creative ways. On "Home" it's tribal rhythms that filled the void. On "Painful Like", the beats have been plumped up to occupy more of the sonic landscape. The closest we come to Feel It Break territory are the vibrant dance atmospheres of "Forgive Me" and "Annie (Oh Muse, You)". What hasn't changed is Stelmanis' voice and her ability to manipulate the mood with it. She's eerie on "Sleep", and downright slithery on the otherwise benign "We Become". 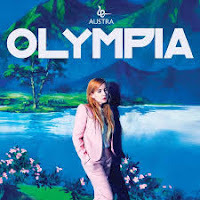 It's when the arrangement is simply Stelmanis and a piano, on "You Changed My Life", that Austra finally reach their full potential. There are still too many lulls on the record for my liking. Aside from the aforementioned "We Become", there's the overly-sedate "Don't Care (I'm a Man)". "Fire" comes across as a half-hearted impression of Dead Can Dance. I doubt that I will ever be a raging Austra fan (although stranger things have happened). However, Olympia is a baby step in that direction for me. Best tracks: "Painful Like", "You Changed My Life"